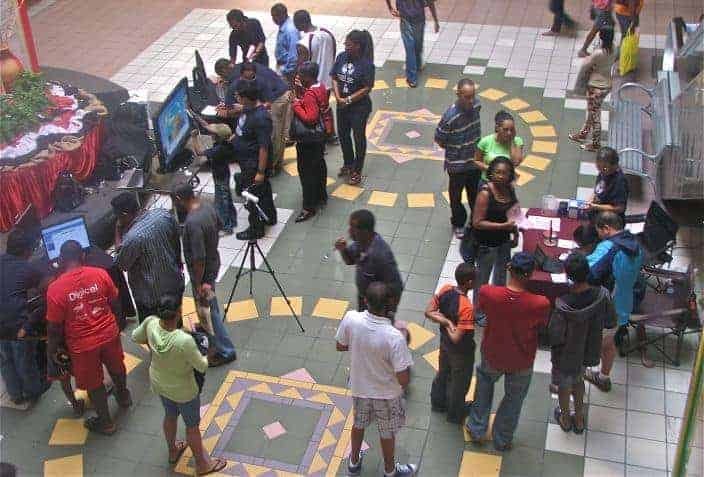 The Trinidad and Tobago Computer Society (TTCS) has held meetings since 1995! Limes are the name given to our discussion where we eat and exchange ideas on a variety of technology and social issues. 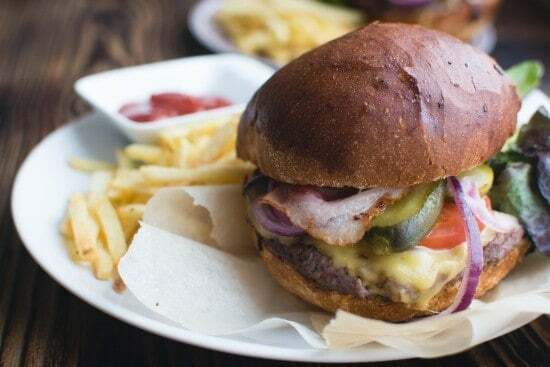 Usually held on the second Wednesday each month from 6 to 9pm. These used to be called PizzaLimes when we were eating at a pizzeria. At Tech meetings, we usually have computers on site to demonstrate a particular computer related issue, either hardware or software. Usually held on the third Saturday each month. Workshops are different from tech meetings when there is a need for members to collaborate on a particular topic/issue. For example, responding to a request for comment on a computer related government law/policy or preparations for future events like Software Freedom Day. Usually held on a Saturday. These are meetings are when we showcase an aspect of ICT in a public setting such as our Software Freedom Day events held over the years. 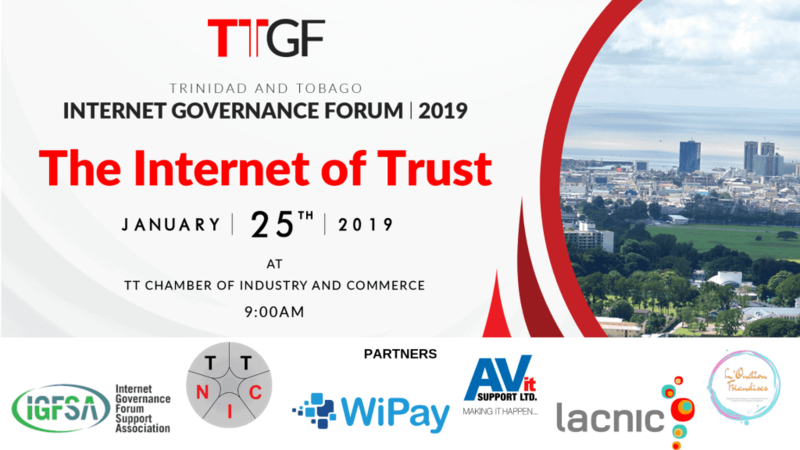 We also have online meetings (now that broadband is increasingly available in Trinidad and Tobago) using VoIP (mostly using Skype so far) when its inconvenient to meet Face to Face. Sep-2018 Trinidad and Tobago Computer Society Lime [Discussion on TATT Net Neutrality and OTT Services] on **Wednesday ** September 12 2018 from 7 to 9:30 pm; please RSVP! Jul-2018 Trinidad and Tobago Computer Society Lime [Discussion paper on Android boxes] on **Wednesday ** July 4 2018 from 7 to 9:30 pm; please RSVP! Jun-2018 Trinidad and Tobago Computer Society Lime [Cybercrime Bill follow-up to JSC] on **Monday** June 4 2018 from 7 to 9:30 pm; please RSVP! Apr-2018 Trinidad and Tobago Computer Society lime on Wednesday April 18th, 2018 from 7 to 9:30 pm; please RSVP! Sep-2017 Trinidad and Tobago Computer Society lime on Wednesday September 13 2017 from 7 to 9pm ; please RSVP! Aug-2017 Trinidad and Tobago Computer Society lime on Wednesday August 9 2017 from 7 to 9pm ; please RSVP! Jun-2017 Trinidad and Tobago Computer Society lime on Wednesday June 7 2017 from 7 to 9pm ; please RSVP! May-2017 Trinidad and Tobago Computer Society lime on Wednesday May 3 2017 from 7 to 9pm ; please RSVP! Feb-2017 Trinidad and Tobago Computer Society lime on Wednesday February 22 2017 from 7 to 9pm ; please RSVP! Oct-2016 Trinidad and Tobago Computer Society lime on Wednesday October 12 2016 from 7 to 9pm ; please RSVP! Sep-2016 Trinidad and Tobago Computer Society lime on Wednesday September 14 2016 from 7 to 9pm ; please RSVP! Jul-2016 Trinidad and Tobago Computer Society lime on Wednesday July 20 2016 from 7 to 9pm ; please RSVP! Jan-2016 Trinidad and Tobago Computer Society lime on Wednesday January 20 2016 from 7 to 9pm ; please RSVP! Dec-2015 TTCS end of year lime on Wednesday December 16 2015 from 7pm ; please RSVP! Nov-2015 Trinidad and Tobago Computer Society lime on November 4 2015 from 7 to 9pm ; please RSVP! Sep-2015 Trinidad and Tobago Computer Society lime on September 9 2015 from 7 to 9pm ; please RSVP! Jul-2015 Trinidad and Tobago Computer Society lime on July 8 2015 from 7 to 9pm ; please RSVP! Jun-2015 Trinidad and Tobago Computer Society lime on June 10 2015 from 7 to 9pm ; please RSVP! Jun-2014 TTCS meeting on “Understanding Bitcoin and virtual currency” has been rescheduled to Saturday 14th June, 3pm – 5pm at UWI Open Campus, Gordon Street, St. Augustine. Trinidad and Tobago Computer Society Lime [Cybercrime Bill follow-up to JSC] on **Monday** June 4 2018 from 7 to 9:30 pm; please RSVP! 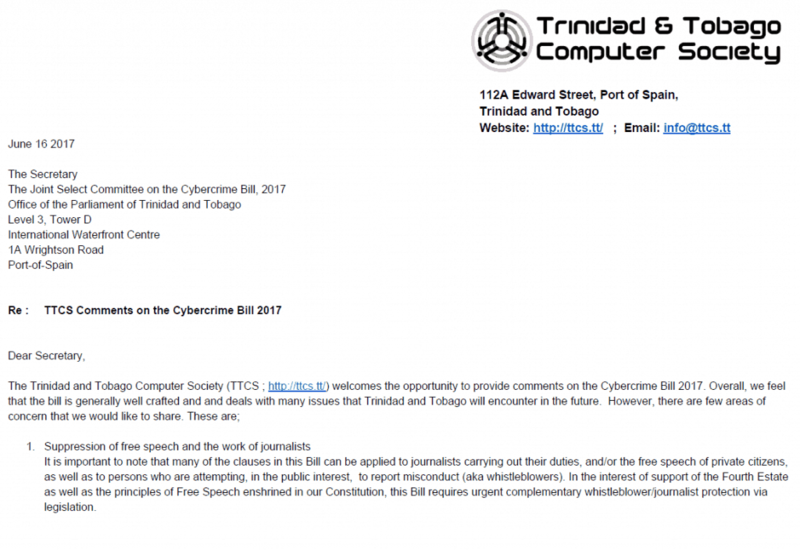 Following the submission of the Trinidad and Tobago Computer Society’s comments on the Cybercrime Bill 2017 and presentation to the Joint Select Committee of the Trinidad and Tobago Parliament (JSC) in May, the Committee has asked the TTCS for specific follow-up on some of our comments, specifically on Clause 18 re: Cyberbullying and the use of satire and parody as a form of cyberbullying. We will be having a lime on Monday June 4th 2018 from 7pm to 9:30 pm at Wendy’s Cafe located upstairs at Wendy’s Restaurant at the corner of Ana Street & Ariapita Avenue, Woodbrook, Port of Spain to discuss this issue and help formulate our response as a group. Please come prepared with your comments and contributions to the discussion. If you are unable to attend, please make every effort to provide your input via the mailing list. Additionally, given enough time, we may tackle discussion on Uber’s decision to pull out of Trinidad and Tobago. Trinidad and Tobago Computer Society lime on Wednesday April 18th, 2018 from 7 to 9:30 pm; please RSVP! The Trinidad and Tobago Computer Society (TTCS ; http://ttcs.tt) will be having a lime on Wednesday April 18th 2018 from 7pm to 9:30 pm at Wendy’s Cafe located upstairs at Wendy’s Restaurant at the corner of Ana Street & Ariapita Avenue, Woodbrook, Port of Spain. Trinidad and Tobago Computer Society lime on Wednesday September 13 2017 from 7 to 9pm ; please RSVP! The Trinidad and Tobago Computer Society (TTCS ; http://ttcs.tt) will be having a lime on Wednesday September 13 2017 from 7pm to 9pm at Wendy’s Cafe located upstairs at Wendy’s Restaurant at the corner of Ana Street & Ariapita Avenue, Woodbrook, Port of Spain. Draft Trinidad and Tobago National Emergency Communications Plan. The TTCS is considering submitting comments on this plan. Trinidad and Tobago’s Draft National ICT Plan 2017 – 2021 (fastforward II) posted for comment. The TTCS is considering submitting comments on this plan. Trinidad and Tobago Computer Society lime on Wednesday August 9 2017 from 7 to 9pm ; please RSVP! The Trinidad and Tobago Computer Society (TTCS ; http://ttcs.tt) will be having a lime on Wednesday August 9 2017 from 7pm to 9pm at Wendy’s Cafe located upstairs at Wendy’s Restaurant at the corner of Ana Street & Ariapita Avenue, Woodbrook, Port of Spain. 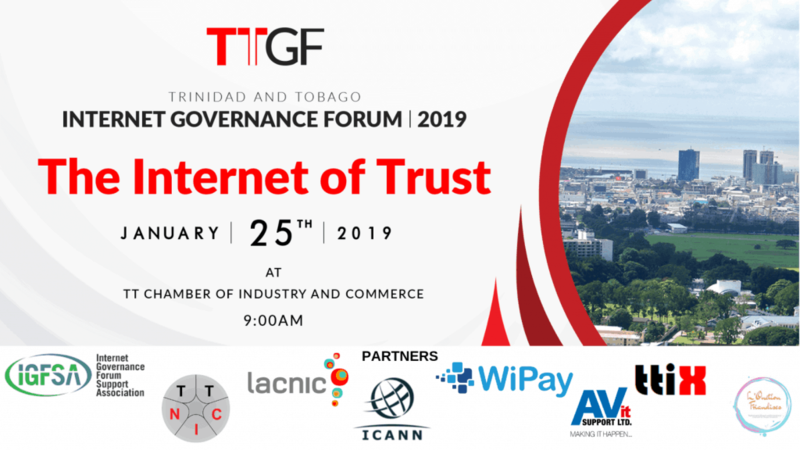 Key focus will be on the Trinidad and Tobago’s Draft National ICT Plan 2017 – 2021 (fastforward II) posted for comment. The TTCS is considering submitting comments on this plan. Latin American & Caribbean Internet Governance Forum (#LACIGF10) from 2 to 4 August 2017 – several persons from the Caribbean appeared on some of the panels. Local courier companies withdraw online tax lawsuit while T&T Government on track to generate $70 million from online tax .